It turns out that diamonds are more than just a girl’s best friend. It’s safe to say that the dazzling industry is growing to be the new playground of choice for investors and collectors alike. Maybe it’s the glamour and sparkle, or the fact that your investment can be worn and envied, but somehow the daunting task of investing seems a lot less intimidating when precious stones are involved. Needless to say, dropping serious cash requires thorough consideration. To simplify things, we sit down with Gemologist and Managing Partner of M&B Private Jewelers – Roi Sheinfeld – who shares a few tips on how to get started in the world of gemstones. What is the first piece of advice you would give to someone who’s interested in buying a diamond? Before buying any stone, you have to identify what your needs are. Is it for an investment? Daily use? A special occasion? Then the obvious one is to consider your budget, and what your ideal stone looks like. From there, the 4Cs (carat, colour, cut and clarity) are good guidelines to look towards to fit your specific requirements. What are some current trends you’ve noticed? It’s hard to say as trends don’t come and go in jewellery like it does in fashion. Having said that, colours have been on the rise, and green is really big right now. There’s especially a major interest in high quality, untreated Colombian emeralds. They can be slightly more affordable than other stones, but still hold great value. Rubies have remained popular for a while now, in particular, the Pigeon Blood red from Burma. That doesn’t seem like something that would lose its desirability anytime soon. Designs are great but only if it’s for personal use. For an investment, people usually are more interested in simple styles like solitaires or the classic three stone ring – hero stone flanked with two complementary side stones. 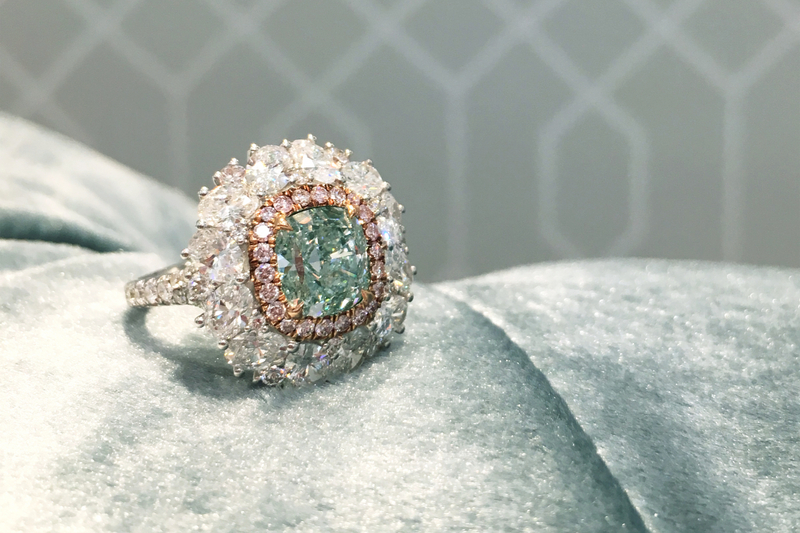 There’s a limit to how crazy the designs can go, because after all, a good stone shouldn’t be overshadowed by an overelaborate design– you want to focus on the sparkle. The same goes for necklaces, bracelets and earrings. What are your recommendations for a “hot buy”? Unquestionably, green diamonds. The starting price is considerably low compared to pink and blue stones of the same quality. Pinks and greens (without a secondary color tone) are about the same in terms of rarity, but green diamonds cost around half the price! All coloured diamonds are doing well, so in my opinion, it’s just a matter of time before the price of green diamonds catapult up there with the other colours. Where is a good place to start looking? Like all investments, do your homework. Begin at auctions and jewellery shows as there is a huge range to choose from so take your time and speak to the experts. Jewellery collecting is a long-term investment, so you’ve got time to find that perfect stone.